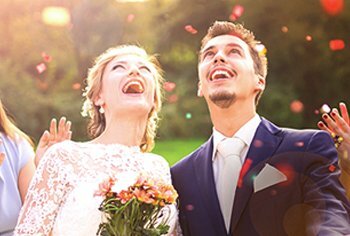 We want to make sure your plan works for you. So, if you have any questions about the SlimFast Plan or products, or need advice on nutrition or the types of exercise that will work for your weight loss goals, we’re here to help. Below are the questions that we get asked the most, but if yours isn't there, just send us an email or give us a call and we'll get onto it. How does the SlimFast 3.2.1 Plan work? Simple, doable and scientifically proven to work, the SlimFast 3.2.1 Plan has been designed to help you make weight loss happen at the safe rate of 1 to 2lbs per week. You can fend off the munchies with 3 of our tasty snack products per day - all under 100 kcal; enjoy 2 of our delicious meal replacement shakes or bars, and tuck-in to one sensible 600kcal meal (800kcal for men). A combination that gives you around 1200-1400 calories per day. 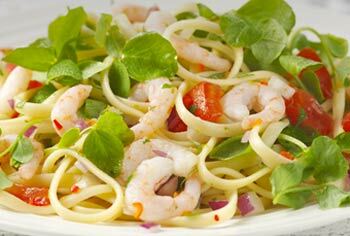 The average woman consumes 2000kcal a day, so you can see how you will lose weight! 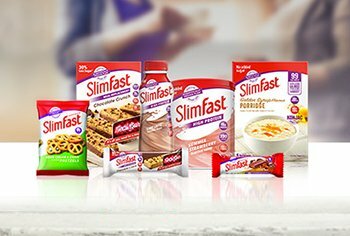 Is the SlimFast 3.2.1 Plan suitable for those suffering from Diabetes type 1, pregnant, breast feeding, other medical condition or those wanting to lose more than 20% of their weight? 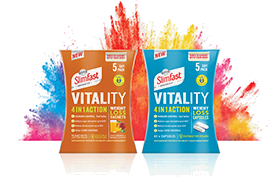 At SlimFast we always advise those with medical conditions or those who are pregnant, breastfeeding or have more than 20% weight to lose, to always speak to their Doctor or Dietician before starting a weight loss diet. Can men follow the SlimFast 3.2.1 Plan? Sure can. However as men generally need more calories than women we recommend they increase their evening meal to 800kcal rather than 600kcal. Should I exercise while on the SlimFast 3.2.1 Plan? Get pounding those pavements! Research shows that people who include physical activity into their weight-loss plan are more likely to keep the weight off than people who only change their diet. Exercise helps you feel and look better. It doesn't have to mean spending 3 hours in the gym every day, walking is acknowledged by experts to be one of the best, most effective exercises. Just remember, do something you enjoy and build the exercise up slowly. If you're new to exercise start gently with a 15-20 minute walk three times a week to build your stamina up. Swimming, bike riding, and dancing are also great forms of exercise. Most importantly make sure it's something you enjoy, that way you're more likely to stick to it. Check with your doctor before starting any type of exercise program. Can I drink alcohol while on my SlimFast 3.2.1 Plan? Beware the booze, it could be your diet's downfall, so it's wise to plan ahead – decide how much you can drink without your dieting willpower disappearing, and then stick to it. And remember, like all foods, alcohol contributes to your daily quota of energy (each gram of alcohol contains 7 calories), so drinking too much can lead to weight gain. Alcohol isn’t that nutritious either, so don't replace meals with it – if you enjoy a glass of wine with dinner, use up part of your snack allowance to do it, and only have a small glass, rather than replacing important nutrients. What is the average weight loss on the SlimFast 3.2.1 Plan? The SlimFast 3.2.1 Plan is scientifically proven to give a weight loss of between 1-2lbs a week. On average the Plan gives you between 1200 - 1400 kcal per day. An average woman usually consumes around 2000 kcal a day. To give a 1lb weight loss a week, you need to consume 500kcal less a day on average. Exercise is also a great way to burn off extra calories. Why I have stopped losing weight/ not losing weight? We know it's disheartening when you've got your sights set on a target, you're sticking to your plan and the pounds just won't shift. There are lots of factors which influence weight loss which have nothing to do with fat loss, everyone is different. But if you don't lose anything for a week or 2 try not to start worrying. Most of the time it is your body adjusting to the weight loss plan. Often the body retains water but still loses fat. Have you tried measuring yourself to see if the inches are still coming off, even though the weight isn't? Exercise can get things moving quicker too. So keep the faith and keep at it! Stick to our maintenance plan and you'll be all over keeping off any unwanted extra pounds. Replace one meal a day with a SlimFast meal replacement shake or bar, and eat sensibly for the remaining two meals, include 1-2 low-fat snacks into your daily diet as well. Keep up the exercise too, research shows that people who include physical activity in their daily routine are more likely to keep the weight off. Chose an activity you enjoy and have some fun! Weigh yourself regularly and if you gain a few pounds, get back on our 3.2.1 Plan and shed them. How do I set an appropriate target weight and assess my own body weight? We're on it - the BMI calculator on our website is the best place to start. BMI (Body Mass Index) is the most common way to determine whether you are underweight, overweight, normal or obese. You can easily calculate your BMI using the calculator on our site. Then, based on your BMI you can set yourself a realistic target to work towards. Remember you are much more likely to succeed if you set yourself several smaller targets, rather than 1 bigger one. Go get 'em! Will I gain extra weight when I come off the SlimFast 3.2.1 Plan? NO you won't gain extra weight. The idea of “dieting makes you fat” has long been disproved. However you will need to eat less calories, approx. 150 kcal less a day for every stone you lose. This is due to the new lighter you, using less energy to move around and complete everyday tasks. It's a good thing too as it puts less strain on your heart, organs and joints. To maintain weight loss we recommend you follow our maintenance plan and continue to replace one meal a day with a SlimFast meal replacement shake or bar and eat sensibly for the remaining two meals, including 1-2 low-fat snacks in your daily diet. Keep up the exercise too, research shows that people who include physical activity in their daily routine are more likely to keep the weight off. Chose an activity you enjoy and have some fun! Weigh yourself regularly and if you gain a few pounds, get back on our 3.2.1 Plan and shed them. Do SlimFast powders contain drugs or Stimulants e.g added caffeine or appetite suppressants? No way - we do not add any stimulants or slimming aids to any of our products. There is some caffeine naturally present in the Chocolate, and Coffee flavours, but no more than you would get in a bar of chocolate or a cup of coffee. It's our scientifically Proven Plan of replacing 2 meals a day with our shakes or bars, having 3 calorie controlled snacks (under a 100kcal) and a sensible 600kcal meal, that helps you shed those unwanted pounds. Does SlimFast provide adequate vitamins and minerals? 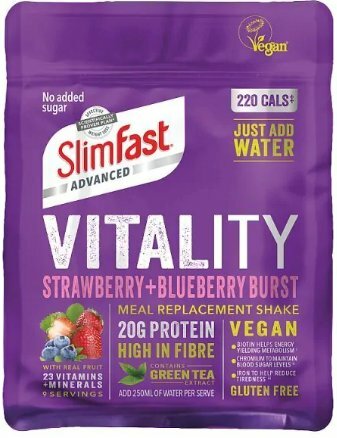 Yes all our meal replacement shakes, powders and bars are fortified with 23 vitamins and minerals to meet your nutritional needs whilst on Slimfast Plan. Each product contains approx 1/3rd of your daily requirments with the rest being made up from your 600kcal meal. Can the ready to drink shakes or powders be heated? Keep them chilled we say. Our shakes taste at their best when shaken and served cold. It is fine to drink them at room temperature but we wouldn't recommend heating them as this may destroy some the vitamins in each product as they are heat sensitive. Serve them chilled but not that chilled! 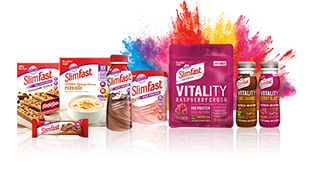 We wouldn't recommend that any of our SlimFast products are frozen as this could lead to a quality deterioration of the product and also destroy some of the vitamins which are present in the product. Can I use yoghurt in place of milk? You could use a natural low fat yoghurt with our shakes, but you'd need to use a lot more of it to get the same amount of protein (around 200g) as you would from using milk. As an alternative you could use a natural very low fat fromage frais which has a higher protein level than yogurt. If you use this you will only need 110g of fromage frais. Can I drink tea and coffee on the SlimFast Plan? Yes, of course you can still drink tea and coffee while you are on the SlimFast Plan, you just need to consider the amount of calories and deduct them from your snacks allowance or main meal. When you make tea or coffee at home, there is usually very little calorie content especially if you only add skimmed milk and have a sweetener instead of sugar. As a guide, a cup of tea or instant coffee with skimmed milk and sweetener is about 25Kcal. Fruit or Green teas are a delicious way to enjoy a hot drink and are only around 5Kcal per cup. Beware of milky coffees from your favourite high street coffee shop. A skinny cappuccino could be around 100Kcal or more especially if it is made with semi-skimmed milk. You can still enjoy these on the SlimFast Plan, you just need to swap one milky coffee for one of your snacks. How to delete your profile form our website and app. Will it be Heavenly Chocolate Delight snack, Yogurt Fruit Crunch meal bar or Simply Vanilla flavour shake? If it all sounds tempting, that's because it is. We've banished boring – so tuck in!